Shrinking Oil Revenues In Alaska May Force Cutbacks To Ferry System For decades, Alaska has collected enough revenue from the oil industry to run government and pay each resident a cash dividend. Now, with oil revenue dwindling, there isn't enough money for both. 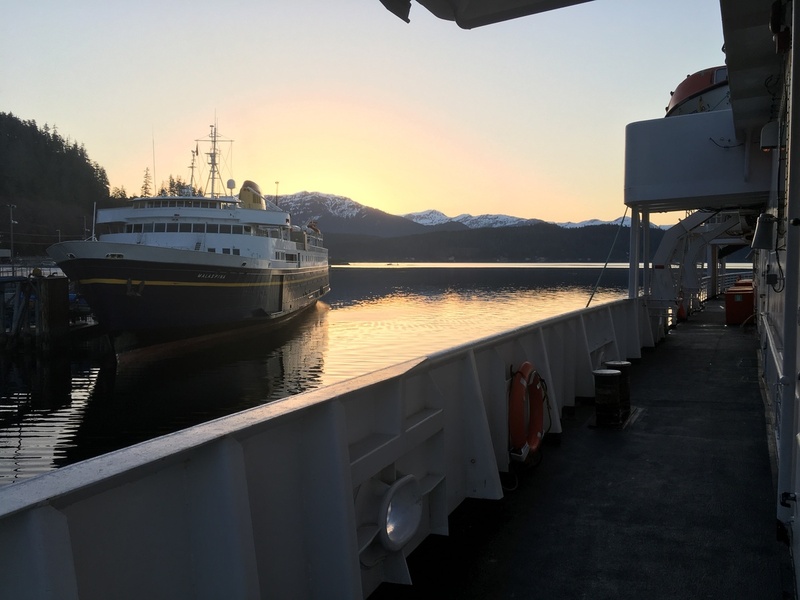 The ferries Malaspina and LeConte are docked near Juneau at sunrise. Both ships are part of Alaska's state ferry system, which could face steep budget cuts Oct. 1, under a proposal by Alaska Gov. Mike Dunleavy. But Alaska's new Republican governor, Mike Dunleavy, is taking aim at the ferry system's budget, proposing sharp cuts that are threatening its future. He's also pushing major reductions to public schools, health care and the state university system. The savings would be used to boost dividends from the state's oil-wealth fund up to $3,000. Oil revenue once was sufficient for Alaska to run its state government and pay dividends from the fund, according to a decades-old legal formula. But amid lower oil prices and a longstanding decline in production, there's no longer enough money to do both. Dunleavy's plan to boost the dividends by cutting government programs is spurring a debate here about what residents value and are willing to pay for. "I'm having a difficult time believing that we take that money off of elders in rural Alaska, we take that money off of 10-year-olds who are saving it up for college, we take that money off of single parents that have three or four children in their families that are struggling. And we bring it into government to continue spending at the rate we're spending," Dunleavy said during a recent appearance on Alaska Public Media. Opponents of the governor's proposals have turned out at demonstrations and public meetings, where they've said his plans would change the character of Alaska – particularly its rural communities. They've also said they're willing to give up some of their dividends or pay taxes – Alaskans currently pay no state taxes on income or sales. It's like a giant step back in time. Onboard the LeConte, Shayne Thompson was contemplating what would happen if the state ferry system stops running Oct. 1, as Dunleavy is proposing. The system, with nearly a dozen vessels, functions as school buses, freight transport and even hearses in the southeast part of the state, a 300-mile-long archipelago where only a few towns are connected to the road system. Thompson runs the store in Angoon, and he puts supplies on the ferry every week. He could hire a barge for deliveries instead, but prices would likely rise by 25 percent and food would come less often, he says. "It's like a giant step back in time," Thompson says. "We would have, basically, fresh produce and dairy for a week or two of the month. And then the rest of the month it would be all dry goods." Southeast Alaska residents and political leaders have staged rallies at the Capitol where they've advocated for the preservation of the system, which is known as the marine highway. Alaska once pumped 2 million barrels of oil a day and accounted for one-fourth of U.S. crude production. But production from the state's massive North Slope fields has been declining for 30 years, and it's now about 500,000 barrels a day. For more than two decades, state lawmakers had debated filling budget deficits with money from Alaska's oil-wealth fund. But they'd never voted to do so until a 2014 crash in oil prices led to the depletion of the state's savings accounts. [T]he best thing to do is reduce the government side of the economy. Last year, for the first time ever, the Legislature voted to use some of the fund's money on general government programs — reducing residents' dividends from an estimated $2,900 to $1,600. Dunleavy campaigned on boosting dividends back to roughly $3,000 this year, and paying residents back for reductions in previous years. He held public forums last month — sponsored by the anti-tax group Americans for Prosperity — where he continued making the case that individuals should decide how to spend their dividends, rather than the government. "We feel that for the sake of the private economy to get that back on its feet, and to grow the private economy, that the best thing to do is reduce the government side of the economy," he said at an Anchorage forum. The governor's critics have argued that, when Dunleavy was a candidate, he promised to pay larger dividends without acknowledging the deep cuts to services that would be required to afford them. At one campaign stop in the Southeast Alaska city of Ketchikan, he said there was "no plan to hack, cut or destroy" the state ferry system. Dunleavy's budget ultimately proposed cutting more than two-thirds from the ferry system's budget, justifying the move by saying that a short-term decline in oil prices had reduced the state's expectations for oil revenue. Thompson, the Angoon store owner, is a Republican who voted for Dunleavy after hearing he would protect the state ferry system. "I feel like a fool, because of listening to somebody that had a totally different agenda in mind when they were on the campaign trail," Thompson says. The state legislature, which is still in the middle of its budget process, has so far rejected or softened many of the governor's proposed cuts. But Dunleavy has line-item veto power that would require three-fourths of the legislature to vote to overturn, prompting anxiety among people who depend on the services that he's proposing to cut. Bert Stedman, a state senator from Sitka who co-chairs his chamber's budget committee, says political dynamics are likely to force residents from his region to accept some level of reduced service. When the ferry system was established a half-century ago, Southeast Alaska's timber industry was booming. Now, Stedman says, "there's no more pulp mills," and there are now two senators that represent Southeast, down from five. "We have had a significant dilution, since the creation of the marine highway, of political influence. And that is continuing to erode," Stedman says. "We are not in the position where we can, frankly, dictate what we want to do. We just don't have the numbers."